THE major backer of the Chooks to Go SBP 3x3 Basketball Tournament underscores the importance of nationalism in the success of every sport. This is one of the reasons why they’re backing the record-breaking event in Sisters of Mary (SMS-Boystown) and SMS-Girlstown on Jan. 12 to 13. President and general manager of Bounty Agro Ventures Inc. (Bavi) Ronald Mascarinas said they have two objectives for this event. “First is for the country to qualify in the 2020 Olympics. All the activities we have joined from the past are leading to our 2020 dreams. The second is for Filipinos. We want the Filipinos to learn to love our country again,” he said in a press conference at the Bai Hotel in Mandaue City on Friday, Jan. 11. Mascarinas said they will do anything to garner the needed points for the team to make it to the 3x3 event in the Tokyo Olympics. “I believe that we will make it to the 2020. We are doing the right things to achieve it. We will make the investment to make it happen,” said Mascarinas. 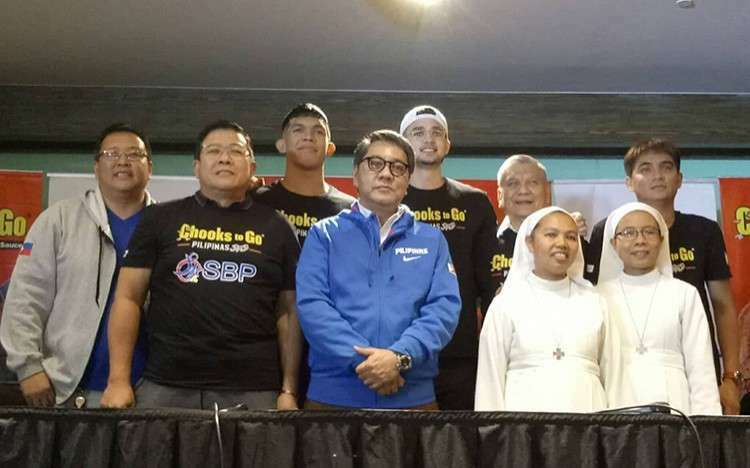 He was joined by SBP executive director Sonny Barrios, Gilas Pilipinas team manager Butch Antonio, Kobe Paras, Thirdie Ravena, SBP regional director Rico Navarro, athletic director Van Parmis and the sisters from both SMS-Boystown and Girlstown. The massive two-day sporting event aims to set a new record for the most number of simultaneous games played for Under-18 players. It is also set to help the country’s ranking in the 3x3 which is currently at No. 25. “For us to speed up in the ranking, we need to play more games and register more people on Fiba. These kids will be playing to help the country’s ranking,” said Barrios, who added that they want to make this a memorable experience for every kid involved in the tournament. “The SBP embraces basketball not just for the sport. The sport gives the time tested values in life. Values like team work, hard work, respect for authority, following rules and regulations and nationalism. You can bring these values wherever life takes you,” said Barrios. With the 3x3 games played outdoors, the major concern for the organizers is the weather condition. “We offered eggs to St. Clara. The last time I checked the weather forecast, it is now mostly cloudy on weekend from the previous forecast of rain. It seems now that we are going to get a good weather,” said Barrios. If it rains, the organizers will utilize the indoor courts and that will take them 12 hours to finish the tournament compared to only three hours when they can use more than 40 outdoor courts. The representatives of both schools said the students are very excited about the tournament and in fact they lose sleep as they pray for the event to push through in good weather. The tournament will be played at the Boystown campus in Minglanilla on Saturday and at the Girlstown Campus in Talisay City on Sunday. There are 1,111 players or 277 teams from Boystown and 1,588 players or 387 teams from Girlstown. Both Paras and Ravena said they will be in the venue for the kids.